Introducing Sous Vide Egg Bites. Perfectly cooked, cage-free eggs are prepared using the French "sous vide" technique resulting in a velvety texture that's bursting with flavour. Available in 2 savoury options. A foodie delight. 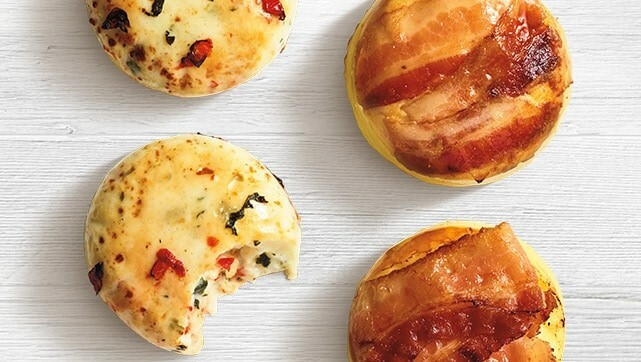 We’ve added aged Gruyere and Monterey Jack cheese to perfectly cooked eggs and topped them with Applewood smoked bacon for a high protein, convenient breakfast. We added creamy Monterey Jack cheese, plus spinach and fire-roasted red peppers for a high protein breakfast that's both delicious and convenient.